The Motorola ATRIX smartphone unveiled at CES 2011 by Motorola and AT&T which caught the individual attention and coverage among the flood of devices that were announced within the CES last month. Check out our Motorola ATRIX Review. Motorola designed ATRIX to provide a device that meets all the needs of the user. They have also introduced an exclusive range of the Docks and additional accessories. It allows the phone to perform a large number of jobs that are not possible on current Smartphones. So, here is an exhaustive review of the device based on the features announced by Motorola. Motorola has fitted a seamless power of dual-core processor NVIDIA Tegra 2 in it and a 4 inches qHD Multitouch capacitive HD Screen in Atrix. It provides nice colors and allows you to view high-definition content, as it is covered with a layer of glass which is anti-fracture and scratches, known as Gorilla Glass. A microUSB and HDMI port. Volume control buttons are on the right side. Standard 3.5 mm jack for headphones and power button at the top. The power button also acts as a fingerprint sensor. Comparing with most Android devices, the screens in Atrix’ is much better as it is enhanced by qHD technology. The screen resolution is 540X960 pixels. The size is of 4 inches. It offers a distinctive experience superior to the vast majority of the screens which other phones currently have in them. There is a 5 Megapixel rear end camera which doesn’t seem to be the best camera. It works well with dual flash LED and power of recording high-definition video at 720px. The front facing camera is useful for video calling and to work as a Webcam. Apart from the Tegra 2 dual-core processor at a clock speed of 1GHz, there is 1 GB DDR2 RAM, 16 GB internal memory which is enough for all your requirements, but if you want more, you can add more, storage capacity by adding a microSD card up to 32 GB additional. At first, you will feel uncomfortable knowing that it comes with Android 2.2 – Froyo. However, as you use you will not feel any lags. As much I think it will be upgradable to version 2.3. In the end, the operating system works great. The experience provides an integrated experience without problems, especially the new version of MOTOBLUR. It looks better and more beautiful than the previous version. The field of multimedia is one of the areas in which the device is especially characterized due to its powerful specs, the device supports a wide variety of file formats such as AAC, H.264, MP3, MPEG-4, WMA9, eAAC +, AMR NB and + ACC in addition to video playback at 30 frames per second. This support for multimedia files without having to install any additional software is very comfortable as it will be able to run almost any video you get on it or downloaded by you. The phone has a capacity of 1930 mAh battery. It approximately provides approximately 13 hours of backup while doing a continuous operation. The activities include running multiple applications, web browsing and listening to music, recording and video playback. However, you will undoubtedly need to charge the phone every day before going to sleep. Motorola introduced some amazing breakthrough accessories for Atrix which increases the functionality of the phone surprisingly. The new accessories include an HD Dock connector and Laptop Dock. The Motorola HD Multimedia Dock has three USB ports and an HDMI port. It means you can connect to a keyboard, mouse, speakers and HDMI-compatible monitor for working at your desk/office. If not this then you can connect to an HDMI-compatible television and home theater audio system. The Motorola Laptop Dock has an incredibly thin design with an 11.6-inch screen, full keyboard, stereo speakers, 36Wh three-cell battery. It can deliver up to eight hours of battery life and weighs just 2.4 pounds. Users dock their Motorola ATRIX 4G into the back of the Laptop Dock to turn it into an active, connected machine. One can experience true mobility at work, home and playing on-the-go in a form factor that’s lighter and smaller than most laptops on the market. It offers a dual-core processor. The processor is capable of opening web pages twice as fast as most other smartphones, rendering games more quickly. It can even stream HD video on big-screen TVs. 1 GB of RAM. It offers twice the RAM of most smartphones. It means you can perform effortless multi-tasking, such as watching a movie while receiving and responding to email. The world’s first qHD display on a smartphone. The screen offers high resolution and 24-bit color, making it easier to read indoors and outdoors. Front- and rear-facing cameras can record in HD. Convenient biometric fingerprint reader enables easy unlocking with extra security. Up to 48GB of storage. 16GB internal and optional 32GB MicroSD card. That should be enough to store thousands of songs, photos, and movies. 2.4GHz and 5GHz Wi-Fi 802.11n support, enabling as much as 50 percent faster download and upload speeds in WiFi mode compared to most other smartphones. Optional AT&T Mobile Hotspot service for connecting up to five additional Wi-Fi-enabled devices. 1930 mAh battery for extended standby and talk time. Two microphones for noise-reduction technology so your calls will be heard loud and clear in even the noisiest environments. Supports HD video capture and replay for most multimedia standards. 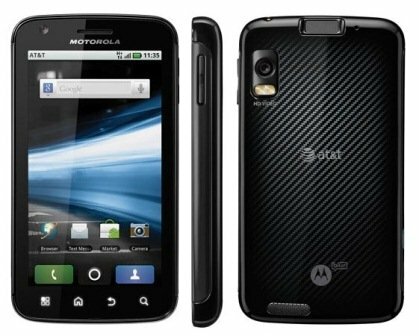 Motorola ATRIX 4G will be available to AT&T customers in Q1 2011. For more ATRIX 4G information visit at homepage and AT&T website. Motorola ATRIX 4G will be available exclusively in the U.S. for AT&T customers. Unfortunately, we have no information yet about the price. We will update you soon as the amount becomes available.